Price: $2614.32 - Add to Cart for Today's Low Price! Zebra MC319Z - 3", RFID, 1D/2D Imager, Windows Embedded Handheld 6.5 , 802.11a/b/g, Bluetooth, 256MB RAM / 1GB Flash, No camera, 48 Key Keypad. The Zebra MC3190-Z RFID Terminal represents another RFID first from Zebra - the first business-class handheld RFID reader designed specifically to extend the benefits of RFID beyond industrial spaces and into customer facing and business environments. 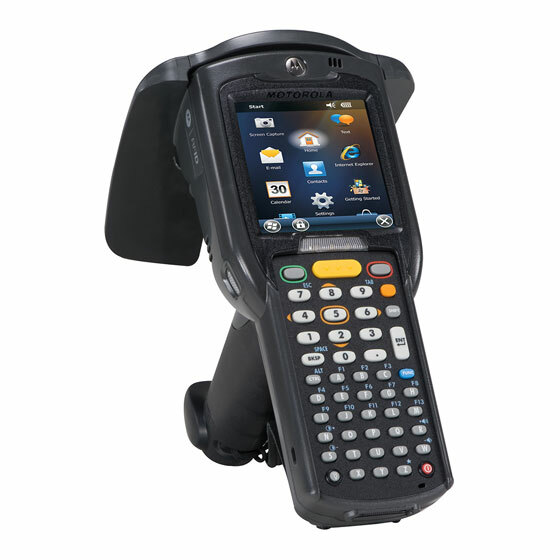 The MC3190-Z starts with the same signature rugged design and high performance for which Zebra's industrial handheld RFID products are known, and adds the ergonomics required for all day comfort and ease of use. Add a groundbreaking new antenna design that drives RFID performance to new heights and the result is a highly versatile device that is at home in customer facing environments - from retail stores and healthcare facilities to the business office. Use the Zebra MC3190-Z RFID terminal in business class environments for solutions including Rapid Inventory, Asset Locating, and Quality Inspections. Your Zebra MC3190-Z barcode terminal comes with a standard 1 year warranty that protects you from manufacturer defects only. That does not cover accidental drops or any damage you do to the device. That is where OneCare Essential Service comes in. This service covers your MC3190-Z for 3 years with hassle free repair service with no questions asked repairs keeping your devices running at peak performance. Do I need software for my Zebra MC3190-Z to scan RFID tags and save data? Yes, the Zebra MC3190-Z does not come with software. Our TracerPlus Mobile Software is a great solution for the Zebra MC919Z and allows you to create custom RFID enabled forms with no programming. Bundled Kits are also available with Hardware and software.